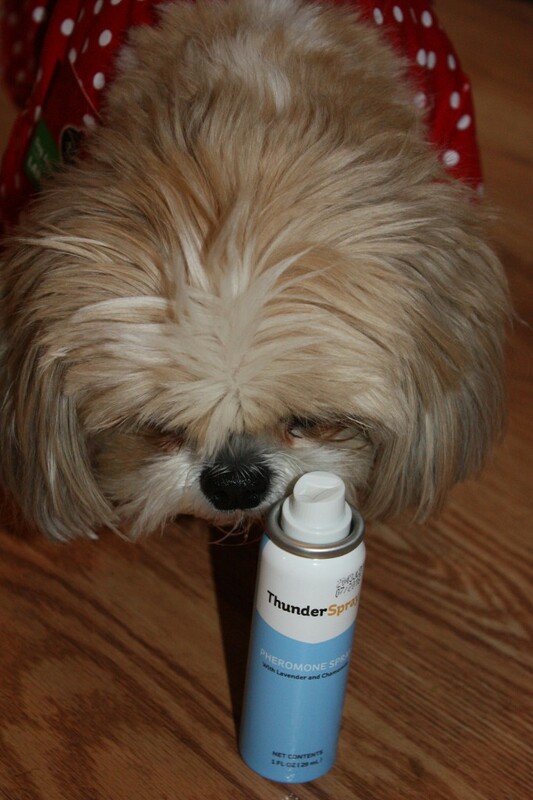 I receive a sample of ThunderSpray to faciliate my review. All thoughts are my own. The holidays are so busy. people are always rushing around. People are in and out of the house and stopping by. I notice my animals can get a bit upset during this time of the year. My cats freak out as we tear up the house, rearrange things to make room for the tree and the presents. Plus as new people come in and out, there are new smells and new hands reaching out for them. They tend to get upset and run away, but it can take a day or 2 for them to act normal, like lying around on the couch and foot stools. I hate to see them upset. Angel, the puppy, gets excited about people coming over but she gets anxious about us leaving her, or when she gets around new animals. She has “big dog in a little body complex”. Plus there is the changing weather, which tends to freak her out. I love working with ThunderShirt who seems to get animals. I have tried their thunder shirt with Angel, as well as the ThunderLeash, both of which we feel work rather well. So during times that the animals tend to get more worked up then they need to, I was happy to try ThunderSpray with them. 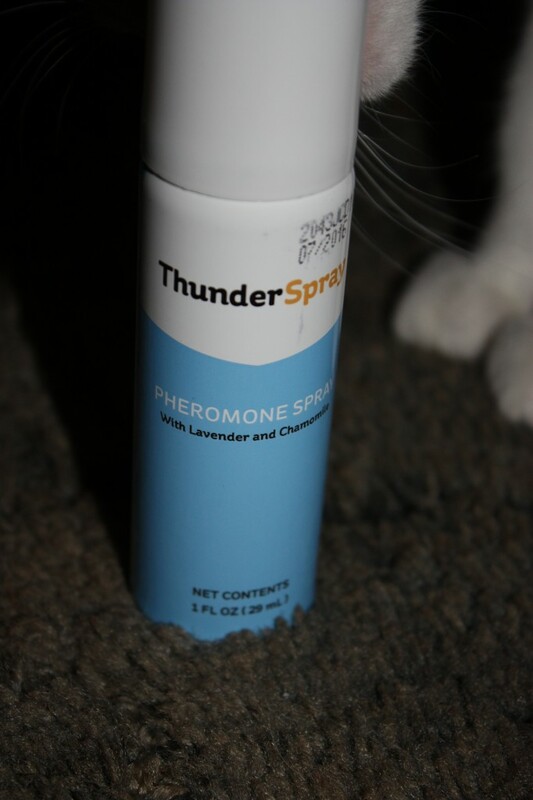 ThunderSpray is a pheromone based spray that also contains Lavender and Chamomile to calm animals in different situations. If an animal get upset about being confined in their crates or about going into a room with a lot of people, the spray can be sprayed into the area before the pet goes in. Lavender and Chamomile is a very calming scent for anyone and the animals feel the same way. The pheromones add to it so that it can help reduce the amount of stress the animal feels. In cases where a storm is coming and the animal get a bit anxious it can be sprayed in the area that they are staying but also under the edge of the ThunderShirt for added relief. Or even sprayed near the neck of the animal during a walk. Whenever the animal is anxious it can be used. I noticed for the cats, they enjoyed where I sprayed it and would settle down into that area. I like to spray it on their favorite sleeping spots and when things got a bit crazy in the house the cats would still gravitate to those spots rather than hiding for the rest of the day… or week. Angel responded very well to the spray. It seemed to ease her seperation anxiety a bit. While she still minded being left, She would settle much quicker than normal. She also did not freak out as much at the animals going by the windows. And as for the last storm, the spray seemed to pick up where the shirt left off and helped her stay even more calm. I love the ThunderShirt products we have tried. I recommend them people I talk to you as we are talking about the animals. And I highly recommend them to my readers. I do not think everything works for every animal and some things work better for others than work for my pets. But I have found that the ThunderShirt products do a great job. I think they make a great gift idea for the pet lovers in your life.